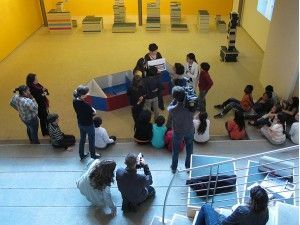 Originating in Jordi Canudas's project in Vic's Remei district, the project is this time being presented in Mataró, in collaboration with three local artists who are taking the process to 3 schools in 3 different districts of the city. 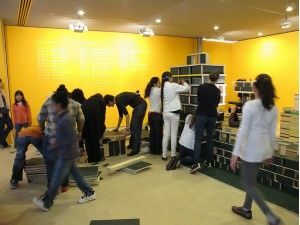 The result of the three processes and the documentation will be added to the exhibition and initial project. 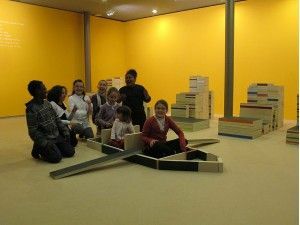 The project with third year pupils at the Camí del MIg school focuses on a proposal for a public sculpture for one of the two motorway roundabouts on either side of the neighbourhood. 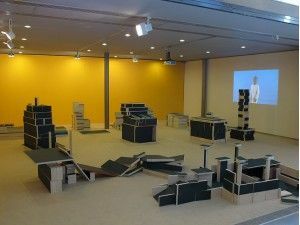 It works upon the concept of public space through the construction of a sculpture which runs as a leit-motif. Pupils from the fourth year at the Montserrat Sola school establish links with the district through an exploration of the territory from different perspectives, but always with the presence of the sea, and its influence in the district. The result of the project will be the construction of a wooden boat. 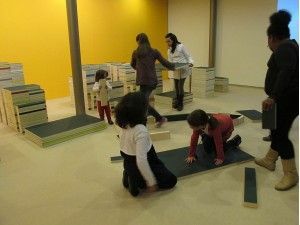 On The Doorstep_ and The Builders (Al Portal de Casa_ Els Constructors_) is a project directed by Jordi Canudas, a cross-collaboration with infant- and primary-school pupils of Escola La Sínia in the Remei district of the city of Vic. 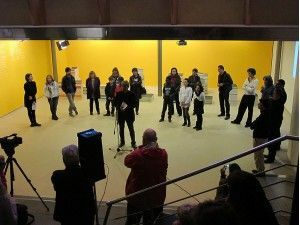 A project within the field of contemporary art, from February to June 2011, working in the specific context of a district, the Remei district of Vic, once a redevelopment funded by the Pla de Barris has been completed. become aware of changes in the district. 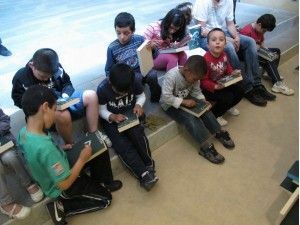 La Sínia gathers together the district's current social reality, with a significant number of children from various geographic, cultural and linguistic origins, with 25 different nationalities, and understanding the learning of the language of utility and communication, Catalan, as an essential element of cohesion and equality. 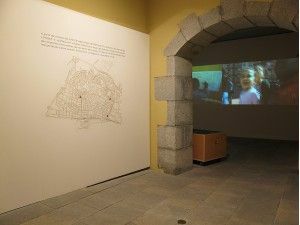 On one hand, Canudas, in this project, takes an interest in both the physical and social changes of recent years in many of our districts and cities. 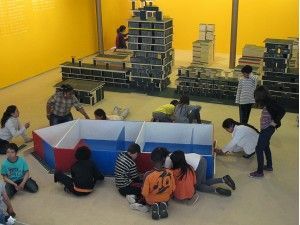 On the other hand, The Great Game THE builders_ focuses on the possibility of weaving a collective relationship between children, district and city, creating together with the children of the School La Sínia, a big construction game with wooden parts, shapes and measures corresponding with real elements of their immediate surroundings: house, school, neighbourhood... (the classroom table, the folder, the blackboard eraser, concrete street paving-tiles, the park swing, advertising hoardings, house letterboxes, the television, the wardrobe drawer...). 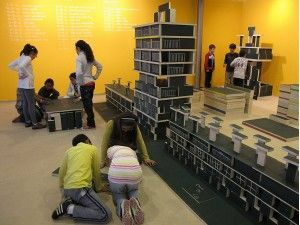 A game which, apart from its practicality and its educational content – forming part of the regular course programme for 1st and 2nd year pupils -- also involves itself in the symbolic dimension, since these children today, with the potential for cultural richness and diversity, are the real builders of the district and the city's future. A revealing gesture, a measure for learning, aiming to build the sense of belonging to a territory, giving importance to the protagonists as citizens. A project combining ethics and aesthetics. 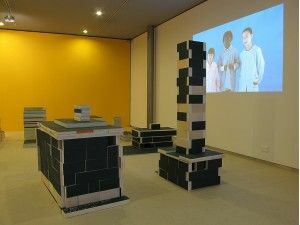 The Great Game The Builders_, was also created with the intention of being exhibited outside of its immediate district. It was intended as a platform to establish links with the social realities of other schools, other districts, other cities. From the work carried out with the boys and girls from La Sinia school, a quantity of educational material was produced, and the Great Game will be loaned to other schools, the presentations to be made by the pupils of La Sinia themselves. 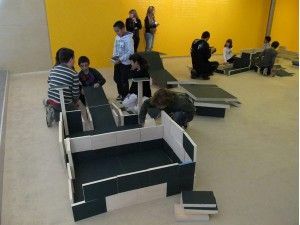 The project is this time being presented in Mataró, in collaboration with three local artists who, using their personal connection to the territory, established a relationship between a primary school and the district where this project is set: Dani Montlleó and 3rd year pupils from the school Camí del Mig of Pla d’en Boet district, Gloria Safont-Tria with 4th year pupils at the Escola Montserrat Solà at the Havana District, and Martí Anson with 1st year pupils from the Germanes Bartomeu school in Rocafonda district. 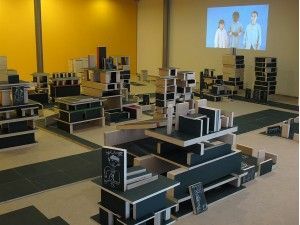 Each artist has made a proposal to their assigned school, from an observation of the context of the neighbourhood. It will consist of researching archival images and documents regarding current events, and also using visits and field work with children to meet and make contact with people in the district. What was the district like in the past, and what is it like in the present day?. 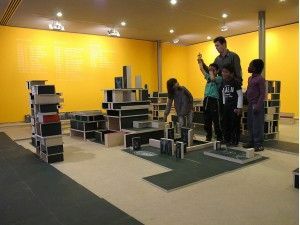 Each school shows the work process and a plan, using the Great Game, observation and their connection to their neighbourhood. 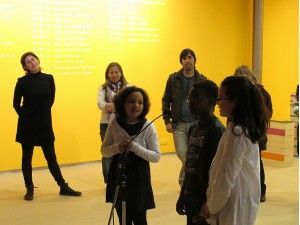 This project arises from an initiative to start collaborative projects among different institutions, based on the idea of connecting art, education and territory. 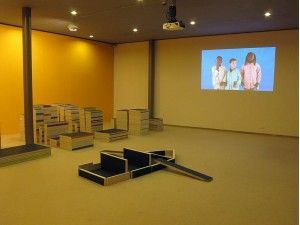 The project weaves Jordi Canudas's experience of the district (territory), and the involvement of teachers and pupils from elementary school and art school students (education) with elements of planning, representation, and assembly of content (art). The result of the three processes and the documentation will be added to the exhibition and initial project. 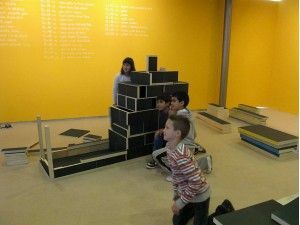 The Great Game The builders_, promoted by ACVic Centre d’Arts Contemporànies, Escola d’Art i Superior de Disseny de Vic, Escola La Sínia and with the support of Pla de Barris i Participació Ciutadana de l’Ajuntament de Vic. With the collaboration of CoNCA Consell Nacional de la Cultura i de les Arts, Generalitat de Catalunya. Project concept and direction Jordi Canudas(visual artist and professor at the Departament d’Arts Visuals de l’Escola Massana Centre d’Art i Disseny-UAB), with the collaboration of Laura Batriu, Idoia Pascual and David Reche (students from the Escola d’Art i Superior de Disseny de Vic), Mia Guiteres (visual artist - ACVic), Montsita Rierola (visual artist and professor at the Facultat d’Educació UVIC), Cristina Ribas and Mireia Tortadès (Outreach officers Vic Sud), David Pujols and Magda Solà (OCCUPATIONAL WORKSHOPS Pla de barris Vic Sud), Mercè Casellas, Laura Carrasco, Elisabet Franquesa, Mercè Godayol, Roger Pich, Marta Puigdesens, Emili Quiles and Mireia Serra (teachers at Escola La Sínia) and pupils of 1st and 2nd year at Escola La Sínia. and Ramon Parramon, ACVic director. Guided visits for family groups (entrance free without prior booking). director) and Ramon Parramon (ACVic director).